Meaning “woven leather” in Italian, Maglieriapelle is an artisanal manufacturer based in Turkey that specialises in premium handcrafted leather shoes for men. In this guide, you will discover the brand and its history as well as a selection of their offerings. Scroll down to read more or use the links above to jump ahead. Head straight to our current reviews of our favourite Maglieriapelle shoes or head straight to their site to buy a pair now with the links below. Alternatively, scroll down to read more about this unique family of artisans. Contemporary shoe enthusiasts today may feel a growing disillusionment when it comes to the retail options presented to them. As older premium brands have grown in popularity, there’s a growing tendency to fall short of their promises in order to meet demand. Meanwhile, Maglieriapelle is a relatively young manufacturer consisting of a family of artisans. 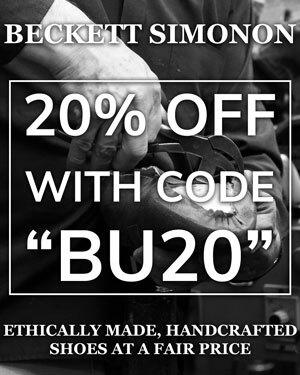 With a passion for traditional handmade craftsmanship, they endeavour to remain loyal to their trade by selling directly to the customer in order to preserve accessible pricing. Maglieriapelle was the fruit of Tarik and Gaye Özkan’s 20 years of experience in the leather industry. In 1997, Tarik started an import and export business for exotic leather. Over the years, he met and collaborated with a number of craftsmen in the industry and was inspired by their artistry. Having garnered a wealth of experience through these exchanges, he and Gaye made the decision to venture into manufacturing footwear. The husband and wife duo endeavoured not to start just another shoe brand but one founded upon the passion and values of traditional shoemaking. Although they had the vision, neither Tarik and Gaye had a veritable background in shoemaking. Therefore, they approached six skilled craftsmen with shoemaking in their blood. Each of these artisans were experts in their own techniques and had been crafting shoes by hand for generations. Thus, Maglieriapelle was born in 2010. Between the artisans’ skilled hands and Tarik and Gaye’s vision, the newly-formed family soon crafted their first models. These were loafers made from imported woven leather, which were popular at the time. This inspired them with brand’s namesake, Maglieriapelle, which means “woven leather” in Italian. However, despite the Italian-derived name, Maglieriapelle is a decidedly Turkish brand with the workshop itself based in Istanbul. As Maglieriapelle grows to become a more established, the manufacturer of luxury shoes ensures that it stays true to its roots. Sharing this vision is Umar Saleemi, a partner and Chief Strategy Officer at Maglieriapelle. Umar believes that Maglieriapelle’s philosophy is intrinsically linked to sophisticated style, expert craftsmanship and a stellar customer experience. 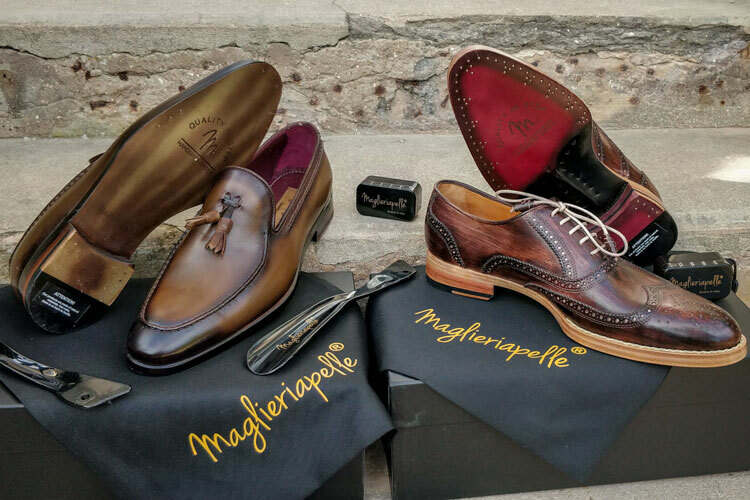 In essence, the Maglieriapelle family seeks to create the best handcrafted luxury shoes whilst simultaneously guaranteeing that they’re available at honest and accessible prices. Today, the Maglieriapelle family consists of fifteen team members. Each of the in-house artisans is a master in their own part of shoemaking and the team works in the factory in Istanbul. Having worked together so closely over the years, the team has grown into a family with strong bonds thanks to their shared passion. Each shoe crafted under the factory roof is a veritable labour of love made with sincere dedication. As a matter of fact, the entire manufacturing process takes place under this one roof and none of the production is out-sourced by third parties. Maglieriapelle’s designers first start by expressing their ideas and inspiration on paper by hand. Although working under Gaye’s guidance, the designers are provided with a long rein to allow their unrestrained creativity to flow with ease. Once their concepts begin to take form, the design team generates them as digital sketches. Digitising the artwork provides a greater freedom for experimentation and allows the designers to effectively test new creations. While some of the designs may be inspired by existing pieces, the majority are new creations. That said, the process is labour-intensive and time-consuming as each model may be the fruit of at least five to seven proposed designs. A fundamental consideration during the design process is the sourcing of raw materials. While the designers work tirelessly on new concepts, other members of the team will seek out new raw materials that are the best candidates. Maglieriapelle uses full-grain calfskin for the majority of their works of which only the highest grades are selected. These are sourced from some of the most reputable tanneries from countries around the world such as Germany and the Netherlands. Nevertheless, Maglieriapelle will travel across the world in order to seek out its exotic leathers including genuine python, crocodile, iguana, and stingray. Once the hides are prepared and the design is ready, it will be Ramazan who will begin by cutting the leather. An expert in his field, Ramazan is known to experiment with new cutting techniques. For each stage of production, it will then be up to Mucahit to prepare the shoes for every process. Meanwhile, Mehmet will ensure a smooth supply chain and oversee the factory floor’s logistics. Once cut by Ramazan, Hakan will then assemble the leather uppers and mount them onto one of Maglieriapelle’s 125 different lasts before stitching. Muhammet is Maglieriapelle’s expert stitcher and a master of the Opanka method, which you can learn about below. He and Muhstesem work on stitching the shoes along with Ufuk. Meanwhile, Ufuk is an Opanka apprentice and currently learning how to undertake this traditional construction method. Meanwhile, the sole production is managed by a slightly larger team. The outsole is first designed by Ramazan (not to be confused with Ramazan the cutter). The outsoles are then crafted by Osman. Following this, the sole assembly is undertaken by both Mustafa and Bulent, which are then assembled onto the uppers using the Opanka stitch. Finally, the shoes are then passed onto Zafer for hand-painting and their patina. Like an artist with a blank canvas, Zafer transforms the shoes into genuine masterpieces. Nevertheless, that is not to undermine the accomplishments of the artisans mentioned above who each have added their own unique touch. Maglieriapelle prides itself in its unique designs and signature hand painting. They take particular delight in their Pamukkale brogues as specimen of their craftsmen’s artistic finesse. However, they also have more conventional shoe designs for those with more conservative tastes. Although Maglieriapelle has complete faith in the abilities of its artisans, the brand is dedicated to providing clients with the best shoes possible. As such, Erol, their factory supervisor inspects each pair of shoes multiple times throughout their production. When finally completed, Yasar will add any finishing touches before packing them for shipment. As you may have noted above, Maglieriapelle shoes are made what is referred to as an “Opanka” stitch. One of the oldest and most reliable construction methods, the Opanka stitch originated in South-Eastern Europe. However, it is relatively unknown today in favour of the Goodyear welt. Nevertheless, the Opanka stitch is incredibly robust and is done by double needle stitching through the lining, sole and upper. As a result, the shoes are more durable, conform to the feet easier, and ultimately provide better comfort and longevity. Yet, it is very hard to and labour-intensive to achieve and requires a master craftsman. If you watch Maglieriapelle’s video showcasing their shoe construction below, you may notice a gluing step during the process. However, as the Opanka is so effective, this is largely a precaution during the manufacturing process. Maglieriapelle’s endeavour is to create luxurious handcrafted shoes that are still affordable. Indeed, even if their shoes are still high-end, it is hard to find handmade shoes with a full leather construction at such a price point. Therefore, a Goodyear welt is something of a redundancy and wouldn’t be necessary thanks to their proprietary construction methods. Nevertheless, Maglieriapelle are considering offering a resoling package in the future if the need arises. However, they have yet to hear from a client who requires it. With their growing notoriety, Maglieriapelle have dramatically expanded their collection of footwear. As well as their signature shoes, they have begun to introduce boots, monk straps, sneakers as well as other leather accessories. 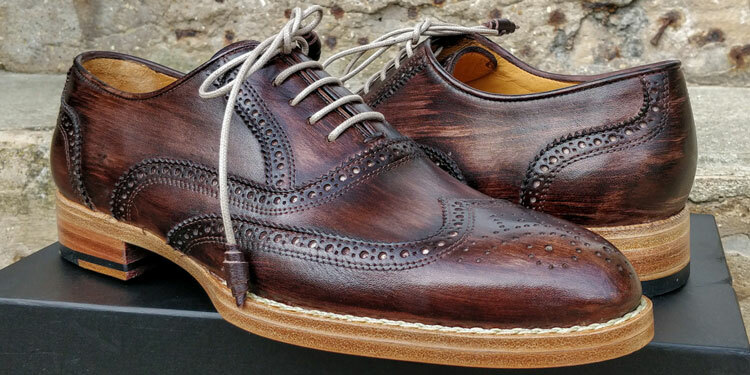 Pamukkale: A traditional brogue with a hand-painted finish as detailed below. Cunda: A tassel loafer as listed below. Ortakoy: A wholecut shoe with a two-tone painted finish. Fethiye: A unique plain-toe derby with distinctive Opanka stitching and perfing. 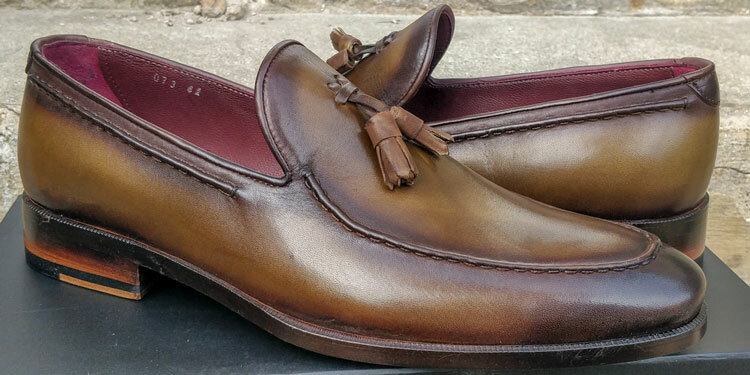 Efes: An original wholecut Oxford with a toe medallion and Opanka stitching. Agva: A suede chukka boot with an artisanal design. Furthermore, Maglieriapelle produces belts and they plan to soon start creating wallets and bags too. Although Maglieriapelle regularly attends trade shows and exhibitions while also keeping tabs on trends, their vision is singular. The brand instead seeks to maintain its own identity by producing footwear that is closer to artwork than a utility. With a hand-painted patina finish, the Pamukkale brogues feature a distinctive Italian touch to what’s an otherwise traditionally British style. Made with a Bordeaux cow lining and double leather sole, they’re robust without sacrificing on sheer style. Thanks to their mesmerising artistic streak and artisanal construction, Maglieriapelle’s are surprisingly versatile. Although perhaps not a shoe for particularly conservative occasions, they’re a daring statement for the office but particularly ideal for going out on special occasions. Although there’s a stunning black and bordeaux option, bear in mind that this will soon be discontinued in the near future. However, we much prefer the beautiful hand-painted brown patina that will continue production as one of Maglieriapelle’s flagship models. Exuding Italian elegance, these charming wholecut tassel loafers feature moccasin stitching across the toe and on the quarters. As with all of Maglieriapelle’s shoes, both the shoes and tassels are hand-painted with a finished leather sole. 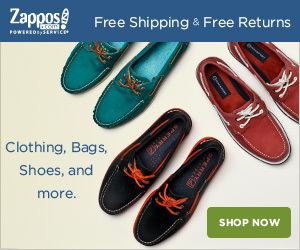 These are excellent shoes for casual occasions where you want to make a statement. Whether it’s an evening out or a business casual day at the office, they will certainly turn heads and receive compliments. Also available in brown and “Taba” tan, there’s a few options to choose from. However, we were all smitten by the tantalising hues offered by the Forest green patina finish. A good wholecut shoe is particularly hard to find as it requires large amounts of high-quality leather. These stunning shoes from Maglieriapelle are certainly unique with brogue perfing and an intricate blue and burned yellow patina with strokes of orange. Exuding true Italian Sprezzatura, these are wholecut shoes that are to be worn with effortless style and nonchalance. Consider wearing them casually with a pair of fitted chinos and a shirt. Alternatively, they’d look great with a modern-cut suit in more relaxed professional environments. We had a slight preference for the blue and burned taba patina. However, there’s also a beautiful taba and bordeaux as well as a tantalising green and taba hue worth checking out. Overall, Maglieriapelle is a unique shoe manufacturer with a rich identity and distinctive designs. Unlike the majority of footwear, their creations are veritable works of art that exude the soul and passion of skilled artisans. Indeed, every pair created and worn will be unique and offer nuances in their expression. While Maglieriapelle may not be as renowned as other brands just yet, it is only a matter of time before they become a critically-acclaimed epitome of craftsmanship. Although a traditional brand, they’re not unaware of the power of social media. As such, you’ll be able to find them on platforms such as Facebook as Instagram. You can also learn more about the brand via their website. Reviewed by Charles-Philippe, on 20th September . "A unique expression of craftsmanship. Full-leather handmade construction shoes with an artistic identity."